Observing the rise of the new wave of service providers over the last few years, the one that has scared the living daylights out of all of the incumbents is Cognizant. Now a $3bn company with deep footprints in the world'slargest global financial institutions, consumer businesses, manufacturing and healthcare organizations, Cognizant can no longer be considered an upstart. It's now part of the industry elite; quietly and cleverly aligning its value proposition to the post-recession era. As CEO Francisco D'Souza points out, we're in a time of not only cyclical change, but also secular change. PF: How are your customers at Cognizant approaching ITO today? Do you see any marked differences since the days before the economic downturn? FD: The years prior to this recession were years of growth, profitability and relative stability in the industries that we serve. The economy, the geo-political environment, our clients’ industries, their business models and their technology architectures were all relatively stable. Now, we see clients grappling with change in many of these elements. This is not just a time of cyclical change resulting from an economic slowdown; this is also a time of secular change, where many of our clients are realizing that their businesses – and supporting technology environments – have to be rethought and changed. In many instances, these secular changes are being driven by technology advances. For example, Media companies are facing pressures to keep up with the demands and revenue generating opportunities an increasingly digital world presents. The digitization of the media industry has very little to do with the recession and is all about change in technology. So what does this mean for ITO? We see clients approaching ITO simultaneously based on cost and on innovation/transformation. The cyclical challenges I spoke about are driving clients to look to ITO (in particular global sourcing) as a means to reduce operating costs, become more efficient and more effective. At the same time, clients realize that the fastest way to become healthy quickly and to capitalize on the secular changes taking place is to transform and innovate. And therefore, an equal number of our clients are seeking fundamental transformation and innovation as they look to enter ITO arrangements. PF: What developments in the technology world are getting you excited today? Web 2.0 Collaboration Technologies and Telepresence –I’m excited about these because, in my view, they demonstrate the ability to create a step function change in the productivity of knowledge workers. Some years ago, we developed a platform called Cognizant 2.0 for our own use within the company. We designed C2.0 to solve the problems of managing work and managing knowledge in teams of highly distributed gold collar workers. What we have found is that C2.0 (which incorporates many web 2.0 technologies) has substantially improved our overall effectiveness. I believe that our example is readily extendable to many businesses and process areas with high concentrations of knowledge workers. Cloud Computing –Much of the discussion around cloud computing has focused on infrastructure on demand. Of course, Amazon.com, Salesforce.com and others are taking cloud computing well beyond the infrastructure layer. I think one of the most interesting cloud services is the Amazon Mechanical Turk which is trying to create a model for services on demand. Overall, I am following cloud computing closely because cloud will drive a complete re-think of client’s IT and operations cost structure. Over time, cloud will allow us to variable-ize cost structures and continue to drive cost out of “context” activities and into “core” activities. Of course, cloud computing is still early and issues such as access, security etc. still weigh on the minds of clients. But like with all technologies, these issues will be resolve over time. Enterprise Analytics - Over the years, organizations have invested in technology to support business decision making within business units or functional areas Enterprise analytics is all about deploying enterprise-level, heavy-lifting analytical algorithms on data that cuts across business and functional silos. This is an area of convergence that I am really excited about — the emergence of an integrated analytical value chain that encompasses unstructured data management, text mining, business intelligence and text analytics. I think that this integrated space will create a new capability for organizations — the ability to go beyond traditional data warehouses and mainstream BI and ultimately lead to true organization-level analytics. This will provide business leaders with the ability to not just obtain individual line-of-business views and to achieve vertical integration, but to also increase the overall analytical footprint of a company across structured/unstructured data and achieve true horizontal scalability. In Part II of this interview, Frank will discuss his views on how ITO service providers can differentiate themselves, the convergence of IT and BPO solutions... and a few other tidbits. 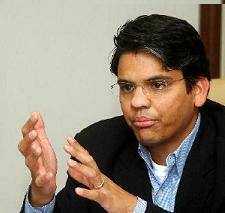 Francisco D'Souza (pictured) is President and Chief Executive Officer of Cognizant Technology Solutions. Great insights Frank - thanks for sharing, and look forward to Part 2. Thank you for sharing - Frank. C2.0 is surely going to be the game changer. Thanks Frank, for sharing your views on the ITO trends. I am also interested to hear more about how you plan to address some of the trends like the demand for hyper-efficiency, near-shoring and reducing margins for the offshore providers. Frank - What kind of business models do you see emerging in the US healthcare. There have been several talks around Single payor system etc. Also some suppliers are taking about SAS model for claims management. How is CTS addressing these issues. Also is CTS doing any enterprise analytics work. What are the tangeable benefits a customer can see using this approach.